Available now to hire - wireless follow focus with focus motor and controller to allow control of prime lenses on your DSLR or other video camera like the Canon C300, Sony FS700, Sony F3 and F5 using a remote control Wi-Fi controller. This is the Remote Follow Focus from Redrock with wireless and auto lens calibration system for manual focus lenses like our wide range of Canon EF compatible Nikon 35mm prime lenses, Canon manual focus lenses, Zeiss CP2 or other small Cine lenses. The digital torque motor can handle some pretty heavy duty lenses but will struggle on massive PL mount Cine lenses and is not recommended for those. This smart piece of kit allows you to control your camera focus remotely via wireless from up to 300ft (90m) away. Ideal for steadicam & Gimbal operations with the focus puller adjusting focus while you work. Combine this remote Follow focus system with a zero delay wireless video sender like our Teradek Bolt or Paralinx Ace and you have a great system to use with camera cranes, jibs and in situations where space around the camera is at a premium. Pull focus in real time and use hard stops on a wider follow focus dial to give you much finer focus control then you can get with short-throw DSLR lenses. The remote follow focus works in a similar way as our manual follow focus versions - ie you turn the focus wheel and your lens focuses from close up to infinity. You can set hard stops on the remote follow focus wheel, or mark up focus points. This is connected to a base station on the rig. This device can be controlled wirelessly via the controller or in a wired capacity using the optional thumb-wheel - useful for hand held shooting when you want both hands on the front handles and don't want or cannot use a manual follow focus. The optional thumb wheel is attached to one of the Redrock handles, giving ENG operators the ability to focus while keeping a firm grip on the camera rig. This system comes with a chunky and well built handheld wireless controller. 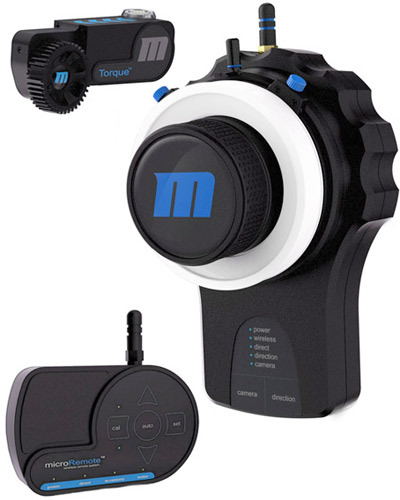 This device has a built-in focus wheel and every small turn will be instantly translated to a corresponding movement in the motor on your rig. When you attach a lens to the system and calibrate it, the system will automatically take it the extreme ends of its settings and use this information to map the complete controller wheel to the distance moved by the lens - thus allowing much finer focus controls then you can get with a manual follow focus on small prime lenses with short throws. This kit is supplied in a custom hard case and includes the torque motor, base station, handheld wireless controller and microflex cables cables for power & connection between the basestation & motor, plus a Redrock micro mount to attach the base station to your camera rig . If your using with a steadicam you probably have mounting points to use the micromount on its own but please ask if you need other attachment options. If you do not have a camera rig already then you will need something to attach the torque motor and base station too. Please see our camera rigs and individual rig parts. Ask us to help build a custom rig for your camera - we have standard rigs for DSLRs like canon 7D and Canon 5D3 as well as standard rigs for Sony FS700, Canon C300, Blackmagic Design cinema camera and other cameras via a sliding plate and rod mount system. This unit requires power from a d-tap (power-con) power supply - like a Vlock battery plate. The handheld controller is operated using 2 x AA batteries (supplied) which last a long time. The Redrock Torque Motor attaches to 15mm rods at the front of your rig and operates the 0.8 pitch lens ring on your lens. We have several optional finger wheel controllers for wired connection to the base station on your rig allowing a single person operating teh remote follow focus from the rig. We have a Rig version of the controller that uses a front handle and handlebar mount to attach to 15mm rods alternatively for gimbal or jib use we have a Universal finger wheel controller that is supplied with a Collins clamp to fit your gimbal. We now have micro flex cables to allow you to use the system on a MOVI 3-axis gimbal as well. The supplied standard cables work well on the RONIN or RONIN-M gimbal but you can use the flex cables to reduce the overall weight. For more information about the system see the Redrock Website or contact us and ask! Yes, the basestation supports both wired and wireless control. The only exception is the microRemote ENG Bundle, which has no wireless option in the base station, and is designed only for wired controllers. Does this unit have firmware version 4.0? If your lens is not listed here, it's likely the Torque motor can drive your lens as well. If your lens is exceptionally stiff, or has a lot of glass to move (such as the large cinema zooms from Cooke or Angenieux), the microRemote offers compatibility with Heden digital motors, including the M26VE. We recommend this motor for those situations where maximum power is a requirement. The microRemote is rated to 300’ line of sight. Obstructions or other conditions may reduce that distance. The microRemote is currently a single channel focus controller. You can use it for one function at a time. You can always run two or more systems simultaneously to control zoom and focus (for example), each with its own controller. Yes - D-tap for 14.4v brick batteries (such as Anton Bauer, Sony V-mount, IDX, Switronix, etc.) is a standard option to power the microRemote.